My boyfriend and I don’t have a patio big enough for a BBQ in our current apartment so we are big fans of our cast iron grill pan. The only problem with this pan is that you have to treat it properly and through misuse we were ready to give up on ours today. I had taken it out of the cupboard a week ago to use it and found it covered with a weird sticky substance. I think it was likely congealed oil from a bad cleaning on previous use. 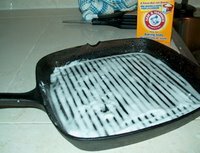 I tried several things to fix our cast iron grill but could not remove the substance… Luckily we were saved by the lady at our local kitchen store and her suggestions. And let me tell you they worked like a charm. Beware that this will remove any food stuck on your pan but will also remove your seasoning. So don’t do it unless absolutely necessary. Sprinkle all over with baking soda. Be generous. Add just enough water to form a paste (a spray bottle works well). Allow the paste to sit on the pan for 30 minutes and then scrub with a nylon scrubbie. Rinse and then Season! Choose an oil to season the pan with, it needs to be an unflavored oil like safflower or canola. Preheat the oven to 450F and brush oil all over the cast iron pan. You do not want there to be drips, but rather just enough to make it shiny. (Sponge off excess with a paper towel.) Bake for an hour and the turn the oven off and allow the pan to cool slowly. To clean the pan allow it first to cool completely. Place it in the sink and run hot water over it for a few minutes to help dislodge any stuck on food. Scrub with water, avoid soap as it will remove the seasoning.